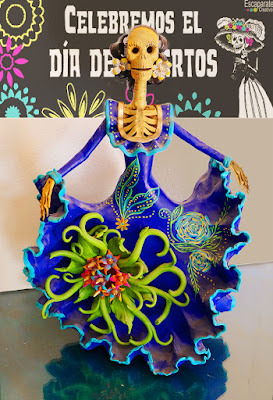 Of all the things that I didn’t get when I wound up in Mexico during Día de los Muertos, the strangest were all the fancy dressed skeletons. I was accustomed to seeing skeletons at Halloween, but not in ball gowns. I blame my avoidance of all things death on my childhood (of course). My mother's family came from Arkansas, and one of their biggest days of the year was Decoration Day, now called Memorial Day. Back then, everyone went to the cemeteries, cleaned and decorated the graves, and had a thoroughly miserable time. As a young kid who didn't know any of the people who were prompting that weeping and wailing, I put it on the list of things I didn't like. So, my intention as the Day of the Dead celebration approached was to simply ignore it. Fat chance! A story about a poor boy with artistic talent started my turnaround. I’m not sure why I wound up at a lecture by Marina Aguirre at the English Library in Mérida, subject: the symbolism of Dia de los Muertos. But, there I was, and as often happens when I do something that doesn’t particularly appeal to me, I wound up surprised and delighted. The basics of the multi-day Day of the Dead celebration were familiar to me, but the nuances of Aguirre’s talk made it much richer than I had previously understood. This celebration isn’t about grieving as much as it is connecting with and honoring the ancestors who are still part of the family even if they no longer have bodies. 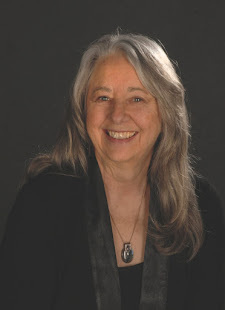 It’s a time to honor and remember them, knowing they may even show up or send you blessings if you have attracted them with all the things they love, such as food and flowers, an altar in their honor, music, prayers, and, of course, fancy dressed skeletons. And, this is where the story comes in. It starts in the early 1900s although its roots trail far back into the past, as do most traditions in Mexico. 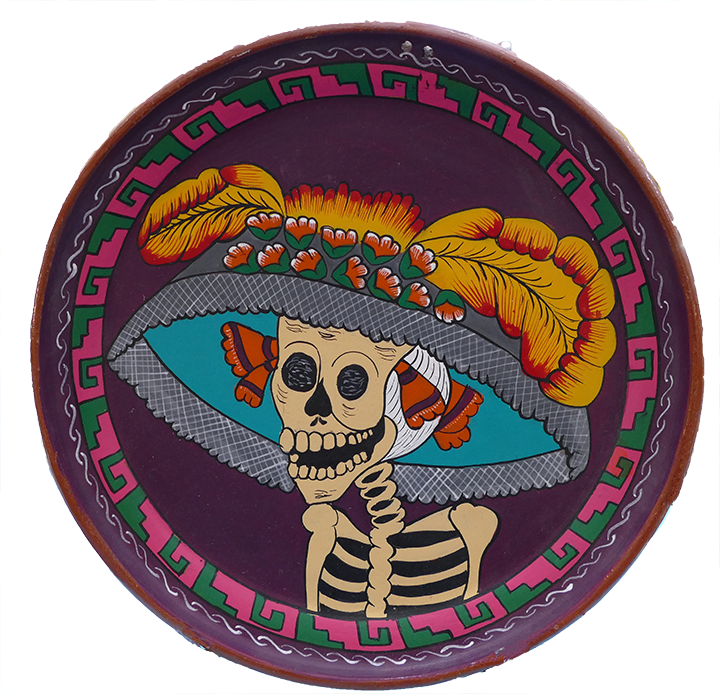 One of the most popular symbols of the Day of the Dead is La Catrina, a skeleton in fancy dress. 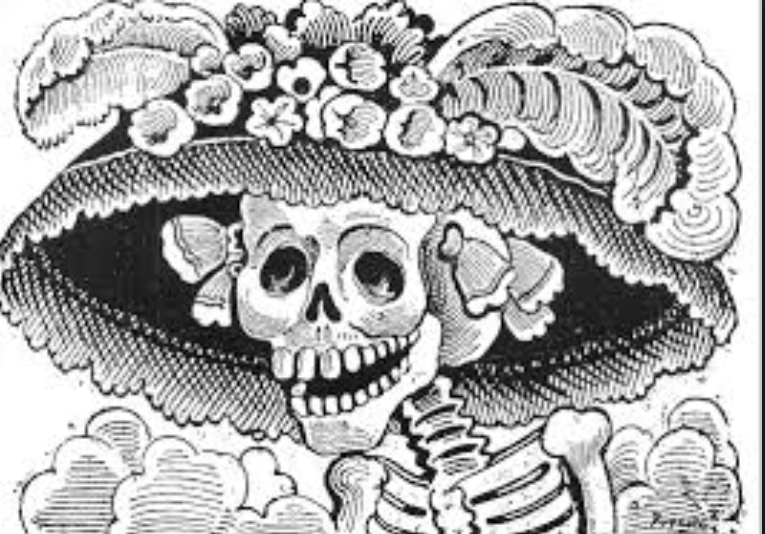 It is said that her roots come from the Aztec death goddess, Mictecacihuatl (pronounced [mik.teː.ka.ˈsí.waːt͡ɬ], literally Lady of the Dead - Wikipedia), but her current popularity began with Jose Guadalupe Posada. Jose was a poor boy with a talent for drawing and a keen eye for the trends of the times. Under the controversial leader Porfirio Díaz, the rich were getting richer and the poor were getting poorer. It was a time when all things white and European were good and all things brown and Indigenous were to be avoided, if you had the money to do so. 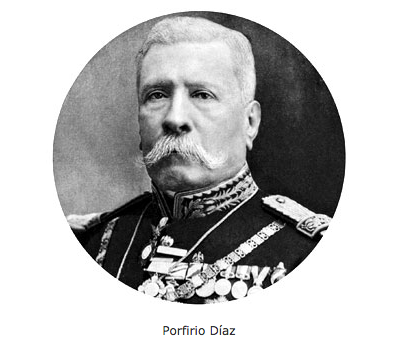 History note: José de la Cruz Porfirio Díaz Mori was a Mexican general and politician who served seven terms as President of Mexico, from 1884 to 1911. The Mexican Revolution began during his presidency in 1910 and lasted until 1920. 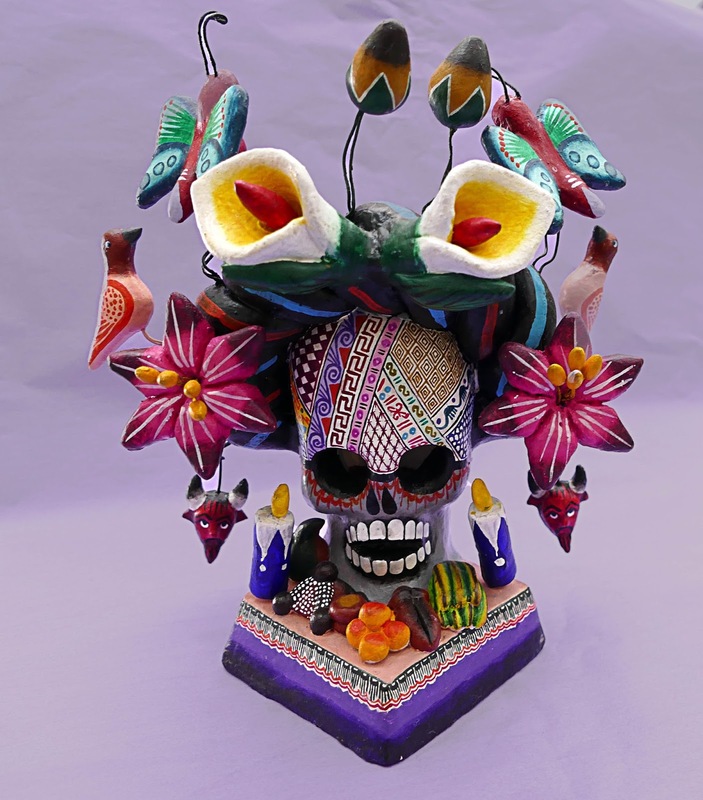 Calavera de la Catrina (Skull of the Female Dandy) and shows a skull wearing a huge, European-style hat, only worn by the wealthy. Unfortunately for Jose, these prints were not destined to bring him fame or fortune. He died poor and unknown in 1913. 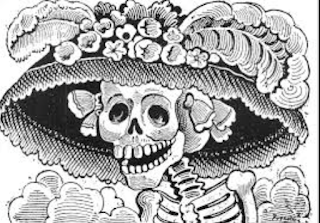 La Catrina, however, did not die. 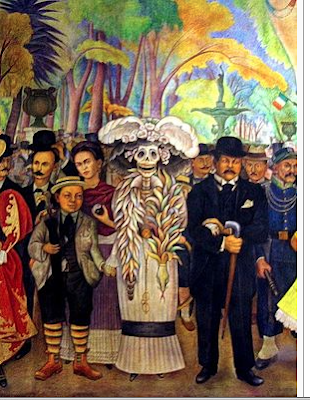 Several years after Posada’s death, muralist Diego Rivera brought Catrina and Posada into the popular imagination when he placed Catrina front and center in his mural, Sueño de una tarde dominical en la Alameda Central or Dream of a Sunday Afternoon in the Alameda Central, a mural that represents over 400 years of Mexican history and is in Museo Mural Diego Rivera in Mexico City. 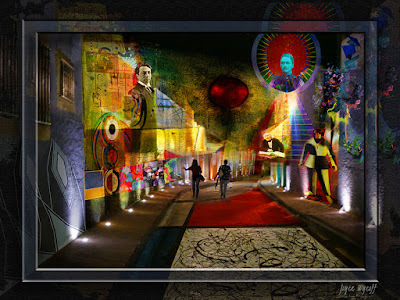 In the mural, Rivera is standing beside an elegantly dressed Catrina and she is holding the hand of a young boy, representing a young Rivera. Behind them stands Frida Kahlo, Rivera’s wife. And, while the mural was painted in the mid-1900s, La Catrina’s popularity has grown steadily since then and can be seen almost everywhere, especially in the lead up to the Día de los Muertos celebration which begins October 31 and continues through November 2nd. She will be seen in stores, homes, altars and walking around during the celebrations as people don La Catrina costumes. 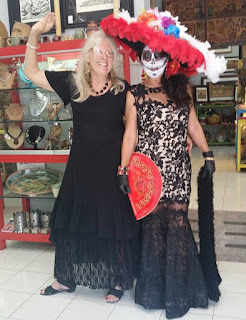 My appreciation for this celebration has grown over my time here in Mexico, especially when I had a chance to speak with Maricruz Ibarra Macias who works with Diane Pearl at a most amazing folk art and gift shop here in Ajijic. She helped me see the layer of humor behind this celebration and how it helps people honor their ancestors ... and, not take death so seriously. If you're in Ajijic on November 2nd, I highly recommend a visit to this colorful shop on the corner of Ocampo and Colon. Maricruz wouldn't tell me what her costume is this year, but here's a picture of her with Diane Pearl last year. * Special thanks to Diane Pearl Colecciones, an incredible gift shop, art gallery and jewelry store here in Ajijic, Mexico, and to Maricruz Ibarra Macias for background information and photos. The background banner for the first La Catrina comes Escaparate Creativo Blog. I like how you intro'd the whole celebration in an earlier post and now delve into to the history. Your photos are stunning. I'd enjoy further delving into the narrator's mentioned "avoidance of all things death" so the personal could unfold alongside the cultural and historical.